Hewell Road newcomer offers a hi-tech service, from designer specs to the latest specialist lenses. When it comes to eyewear, we all know that the health of our eyes is the most important consideration, but we also want our glasses and contact lenses to suit our lifestyles and to look as attractive as possible. Eye Opticians, which has just opened a branch in Barnt Green, offers customers the best of both worlds – an excellent standard of care plus the very latest in eyewear design. Established in 1985, the family business provides an approachable and friendly service backed up by years of experience. Dispensing optician Shafik Haji aims to appeal to a wide spectrum of clients, whether they are looking for funky designer frames, specialist lenses or practical eyewear for children, with options to suit all budgets. 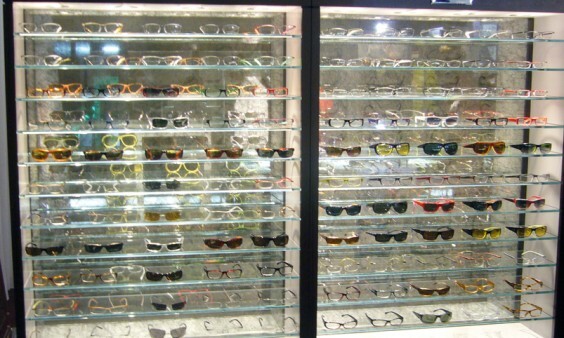 A huge collection of frames is available, encompassing brands such as Alain Mikli, Chanel and Roberto Cavalli as well as a range of economical choices. Customers who have trouble deciding what’s best for them can rely on expert advice from the friendly staff, and Eye Opticians also boasts a special machine that scans the client’s face and creates a series of photographs enabling them to see exactly how the various frames or lenses would look. Dutch company You’S Eyeworks offers an astonishing selection of trendy contemporary frames in an array of bright colours, perfect for anyone who enjoys making a real statement with their glasses. Lenses can be given a coloured tint to match the frames, and this option can be much more than a fashion choice – coloured lenses can also help with several conditions such as migraines and visual dyslexia. “People whose migraines are triggered by lighting effects such as strobes or patterns often find that wearing coloured lenses can lessen the problem,” Shafik says. Adults as well as children can suffer from visual dyslexia, a condition related to light-sensitivity disorders that makes the words on a page (usually black type on white paper) seem as if they are moving and jumping, which leads to reading difficulties and headaches. The problem can be helped with the use of translucent coloured overlays, but precision tinted glasses are the latest solution. “We have been helping people with visual dyslexia for 12 years, and are one of very few centres to do so,” Shafik continues. Eye Opticians also offers a range of other specialist eyewear, such as anti-glare lenses for driving and lenses designed for those taking part in specific sports such as golf or fishing. Meanwhile, the huge selection of sunglasses includes the popular “aviator” style. Contact lens consultations and fittings are another important aspect of the company’s service, and contact lenses for all lifestyles are offered alongside a range of stylish and affordable frames for kids – in some cases the frames are even offered free. Eye Opticians gives each customer a full eye examination using state-of-the-art equipment, and can carry out glaucoma testing as well as other important health checks. At the stylish Barnt Green practice, clients can take their time browsing the options available and even enjoy a cup of coffee as they make their decision – and its location at the heart of the village centre means it’s easy for residents to pop in for check-ups and to collect new glasses or contact lenses.